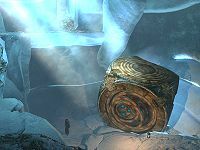 Uncover the secrets of the mysterious Dwemer lockbox. Give the Lexicon to Septimus Signus. Harvest blood from a High Elf, Wood Elf, Dark Elf, Falmer, and Orc. Give the collected blood samples to Septimus Signus. Retrieve the book from within the Cube. Far north of Winterhold, there is a small cave called Septimus Signus's Outpost. Inside, a strange Dwemer cube is being studied by Septimus Signus. He claims the "heart of a God," "heart of you and me," is located inside. He asks you to help him see through the cube. To do so, he plans to use the power of an Elder Scroll. However, he does not possess the knowledge to use the Elder Scroll. To help him, you must travel to the Dwemer ruin Alftand and charge the Lexicon. Be prepared: Alftand is an extensive Dwemer ruin occupied by Falmer and Dwemer constructs, including Centurions. Once there, travel through the ruin, following your destination marker, until you reach Blackreach, a massive underground cavern below Alftand. Alternatively, if you do not feel your level or equipment are sufficient to penetrate Alftand, it is actually unnecessary to do so; Mzinchaleft and Raldbthar both access Blackreach as long as the player has an Attunement Sphere, and both are faster and easier than Alftand. A more complete walkthrough can be found on the Alftand and Blackreach pages. At this point you will have access to a Dwemer lift for quick travel between Blackreach and the surface, in case you want to make a trip back to town before delving further underground. When you are ready, follow the quest marker through Blackreach until you reach your destination, The Tower of Mzark. Inside, you will find the Oculory, a large Dwemer machine that occupies the last room of the Tower. Go up the curving stairs along either wall to find a control panel with a stand that has a slot for the Lexicon. Place the Lexicon atop the stand to activate the machine's control panel. To decipher the code, press the second button from the right four times, pausing between each pressing to allow the Oculory to complete its realignment. This will cause the Lexicon to open and the third button from the right be revealed. Now press the third button twice, which will align the lenses such that they direct shafts of light onto the round, green windows of the Oculory, and also uncover the far left button. Finally, press the far left button once and watch as the Oculory reaches its correct alignment, revealing the Elder Scroll. Take the now-completed Runed Lexicon from the stand, then go to the center of the Oculory and retrieve the Elder Scroll from its cradle for the concurrent quest Elder Knowledge. Once you have both the Elder Scroll and the Lexicon, return to Septimus Signus at his outpost. To continue past this point, you must be level 15 or higher. If you aren't level 15 yet, giving Septimus the Lexicon will result in him dismissing you; then, you must wait until a courier delivers a letter from him to continue. Once you have returned to the outpost, talk to Septimus again. He'll read the Lexicon and tell you he searched for it with the help of the Daedric Prince of Knowledge, Hermaeus Mora. He tells you to harvest the blood of the mer races in Tamriel. Head for the outside of the cave. You will see a Wretched Abyss that has the talk option. Talk to the abyss, and you will learn that the voice coming from the abyss is that of Hermaeus Mora. He claims that Septimus is a good follower, but after he discovers how to unlock the Dwemer box he will have outlived his usefulness. He will then tell you that you should take Septimus's place, which you can agree to or disagree. Neither choice will affect the outcome of the quest. Hermaeus Mora wishes for you to speak with him again after you have completed Septimus's task. Altmer, Bosmer, Falmer, and Orc bodies can be found in Alftand. Bosmer, Dunmer, Falmer, and Orc bodies can be found in Liar's Retreat. Bosmer, Dunmer, and Orc bodies can be found in Rannveig's Fast. Bosmer, Dunmer, and Orc bodies can be found in Silverdrift Lair. Altmer (high elves) are also part of the Thalmor and can be found at theThalmor Embassy. Upon acquiring different blood samples, you will be prompted to return to Septimus Signus's Outpost. Give the blood samples to Septimus and wait for him to open the cube. Following him inside will reveal, much to the surprise of the delusional quest giver, that it was not the "Heart of a God" that was stored inside the cube, but rather a book. His surprise is cut short as his usefulness to Hermaeus Mora has been outlived and he is promptly disposed of in a flash of light. It is revealed that the book on a pedestal is actually the Oghma Infinium. Hermaeus Mora will greet you again, calling you his champion. You can reply with "What now?" or "I am not your champion, monster." Again, there are no consequences to the completion of this quest with either choice. Through conversation with the Daedric prince, you learn that it was sealed here for a reason, so that no more of its dangerous knowledge could be shared with the world of mortals—something that Hermaeus Mora wishes undone. You will automatically start this quest during the course of Elder Knowledge or Scroll ScoutingDG if you have not already started it, as the Elder Scroll is required for both the main questline and for the Dawnguard core questline. This quest does not have to be completed in order to complete either questline, however. You will get a quest stage about finding the scroll for Paarthurnax even if you get this quest from the Dawnguard questline and have never yet met the dragon. If you choose to leave Septimus Signus's Outpost without picking up the Oghma Infinium, the Dwemer puzzle door that was unlocked by blood will be closed permanently. You don't have to access Blackreach through Alftand, as it's also possible to reach it through the two other linked Dwemer ruins, Raldbthar and Mzinchaleft, by using the sphere given by Septimus on the apparatus at the end of these dungeons. The "Heart of a God" to which Septimus refers is actually the Heart of Lorkhan. However, there is no Heart inside the chamber. It is not necessary to take the Elder Scroll during this quest. If you plan on playing for some time between this quest and completing Elder Knowledge and don't wish to carry the scroll around in between, you can leave the scroll in the Tower of Mzark after transcribing the lexicon. The location of the scroll never respawns, so you can come back for it later at any time. If you retrieve the Elder Scroll during this quest, it is not given away at completion. As such, you will be stuck with an Elder Scroll in your possession. Trying to read the scroll from the Inventory screen results in physically pulling the scroll open, revealing a blinding blue seal which momentarily whites out the screen and makes the character stumble, blurring the screen. The Elder Scroll can be sold to Urag gro-Shub in the College of Winterhold's Arcanaeum for 2000 gold. However, do not do so until you have completed Alduin's Bane, as it is essential to the main quest. If Dawnguard is installed, the Elder Scroll is also needed to complete its main questline, though you can buy it back from Urag if you have already sold it to him. If you give the lexicon to Septimus before reaching level 15, it may be necessary to wait for a letter from him to arrive via courier. Simply returning to him when you reach that level will not work. Corpses fed on while in Beast Form or with the Ring of Namira cannot be harvested for Septimus. Avoid feeding on the named, dead Elven corpses inside Alftand as you will have to find samples in other, potentially far apart, locations. However, if Dawnguard is installed, you may be able to harvest corpses while in Beast Form, as long as you have advanced far enough in the quest to have been given the extractor. You can keep the Oghma Infinium after use by dropping it before exiting the inventory upon its initial use, however, it will only be a book, and will not grant the bonuses again. Otherwise it will disappear after you use it. If Dragonborn is installed, Hermaeus Mora will not be represented as a large purple shape. Instead, he is shown as the tentacled form seen during the quests of the plug-in. If Dragonborn has been completed before talking to Hermaeus Mora in this quest, he will say that he has been "following your progress since you defeated Miraak." It is possible to loot the body of Septimus Signus and get the Runed Lexicon and Extractor back. Once in your inventory, however, both the Runed Lexicon and the Extractor will be considered quest items and cannot be sold or removed. This issue has been addressed by version 1.0 of the Unofficial Skyrim Patch; the Extractor can be removed/stored. You can remove the Runed Lexicon from your inventory using the console command player.removeitem 3a3dd 1. If you kill Septimus Signus right after he gives you the stage to harvest blood, you will fail the quest, but the game will still prompt you with the "Harvest blood" option every time you loot the corpses of Orcs or elves. You may not have the "Harvest blood" option despite having the Essence Extractor in your inventory. Use the console command player.addperk 79af5. Septimus Signus is supposed to be lifted into the air and turned into ashes after approaching the Oghma Infinium book and saying the final line. However, there is a bug where the event is sometimes not triggered due to a bad animation registration event which then makes the quest impossible to complete. The most reliable solution to this problem is to kill Septimus. Once the quest has progressed to where he should be dead killing him does not count as a crime. Alternatively, reload an earlier save (before giving the blood to Septimus). If inside, exit the cave and wait for an hour while outside before re-entering. This can fix the event to trigger normally. If you remove the Elder Scroll before the Blank Lexicon is transcribed, you may be unable to proceed with the quest. Also, it is possible that if you remove the scroll without retrieving the lexicon, you will not "discover" the Tower of Mzark, and you will not be able to fast travel there. This can be remedied by fast travel to Fort Dunstad and following the trail SSW. The gates will still be open to the Tower of Mzark, and you can retrieve the lexicon. There is a second Attunement Sphere on the ground in Sinderion's Field Laboratory; picking this sphere up will leave both permanently stuck in your inventory. You can use player.removeitem 3532c 2 in the console to fix this however doing so may prevent you from opening more paths to Blackreach. If you are finding the Elder Scroll for a Dawnguard quest, the journal entry will still say "Find the Elder Scroll for Paarthurnax" even if you have never met him. This bug is fixed by version 1.1.2 of the Unofficial Dawnguard Patch. After Septimus is killed, picking up the Oghma Infinium may not trigger the next stage of the quest and Hermaeus Mora may not appear in the passageway. ? The console command setstage DA04 60 can be used to make Hermaeus Mora, if not, continue with next line. The console command setstage DA04 100 can be used to advance the quest manually. 5 I've been given a book of bizarre ramblings about Elder Scrolls, written by Septimus Signus. He claims to have spent time at the Winterhold Arcanaeum. 10 I've learned that Septimus Signus, a preeminent scholar of the Elder Scrolls, is currently living in the far north, studying a dwarven artifact. He might know where I can find an Elder Scroll for Paarthurnax. 20 I met Septimus Signus, a brilliant but mad scholar living in the northern ice fields. He's directed me to a dwarven observatory that supposedly houses an Elder Scroll. He doesn't care about the Scroll itself, but wants me to use some kind of machine there to inscribe a dwarven lexicon with the Scroll's knowledge and bring it to him. 35 I met Septimus Signus and brought him a dwarven lexicon containing the distilled knowledge of an Elder Scroll. With it, he believes he can open the lockbox he's been studying. He will contact me when he has the secret. 40 I met Septimus Signus and brought him a dwarven lexicon containing the distilled knowledge of an Elder Scroll. With it, he believes he can open the lockbox he's been studying by creating a mixture of blood that will resemble dwarven. I need to collect blood from several different races if I want to help him. 100 Finishes quest I met a strange hermit named Septimus Signus, who needed the knowledge of an Elder Scroll and a collection of blood to open a dwarven lockbox he had studied for years. I helped him open it. 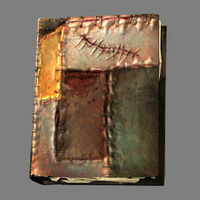 It did not contain what he had expected, but instead a book of great knowledge, the Oghma Infinium. 105 Fails quest I met and killed a strange hermit named Septimus Signus, who needed the knowledge of an Elder Scroll and a collection of blood to open a dwarven lockbox he had studied for years. The following empty quest stages were omitted from the table: 1, 60, 200. On the PC, it is possible to use the console to advance through the quest by entering setstage DA04 stage, where stage is the number of the stage you wish to complete. It is not possible to un-complete (i.e. go back) quest stages, but it is possible to clear all stages of the quest using resetquest DA04. This page was last modified on 23 March 2019, at 23:01.